The leaves of Mitragyna speciosa, a tropical plant known as “kratom,” have been traditionally used as a substitute for opium in Thailand and Malaysia. Mitragynine, a major constituent of M. speciosa, has an opioid agonistic activity, and its derivative 7-hydroxymitragynine (7-OH-mitragynine) (a minor constituent) is much more potent than mitragynine or morphine. Recently, many products containing this plant have been distributed as “incense” on the drug market in Japan for their expected narcotic effects. Despite their potency and their wide distribution for abuse, there are no reports on the quantitative analysis of mitragynine and 7-OH-mitragynine in the raw materials or in the commercial products of kratom. 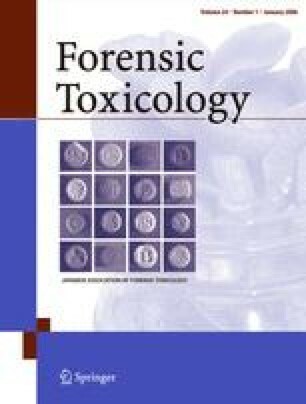 In this study, a method for simultaneous analysis of mitragynine, 7-OH-mitragynine, and other indole alkaloids (speciogynine, speciociliatine, and paynantheine), present in the raw materials and commercial products of kratom, was developed using liquid chromatography-electrospray ionization mass spectrometry (LC-ESI-MS). By this method, mitragynine, 7-OH-mitragynine, and the other alkaloids were detected in 11 of the 13 products. The content of mitragynine in the products ranged from 1% to 6%, and that of 7-OH-mitragynine from 0.01% to 0.04%. Because 7-OH-mitragynine is much more potent than morphine, M. speciosa abuse is a matter of major concern. The present analytical method is considered useful for the screening of M. speciosa products in the drug market.